WASHINGTON (CNS) — Two management experts at a March 26 conference explored how organizational behavior within the church may have contributed to the clerical sexual abuse crisis. During the daylong conference at The Catholic University of America, Gary Weaver of the University of Delaware and Michael Edward Brown of Pennsylvania State University Behrend explained it was possible that diverse organizational factors contributed to “the particular problems that occur in different parts of the church,” including an individual parish or diocese. Factors that influence organizational behavior include an ethics infrastructure involving rules, policies, programs and monitoring procedures; organizational culture as expressed through the actions of leadership; and the conflicting roles of bishop as CEO of a complex organization and spiritual leader of a flock, they said. Organizational behavior is an interdisciplinary social science focused on behavior in and by organizations. The joint presentation by Weaver and Brown came during the university’s ongoing “Healing the Breach of Trust” conference series. The conference was the third sponsored by the school’s Catholic Project, which was formed in 2018 to examine the clergy sexual abuse scandal after it erupted again last summer. Subtitled “What’s Really Going On? 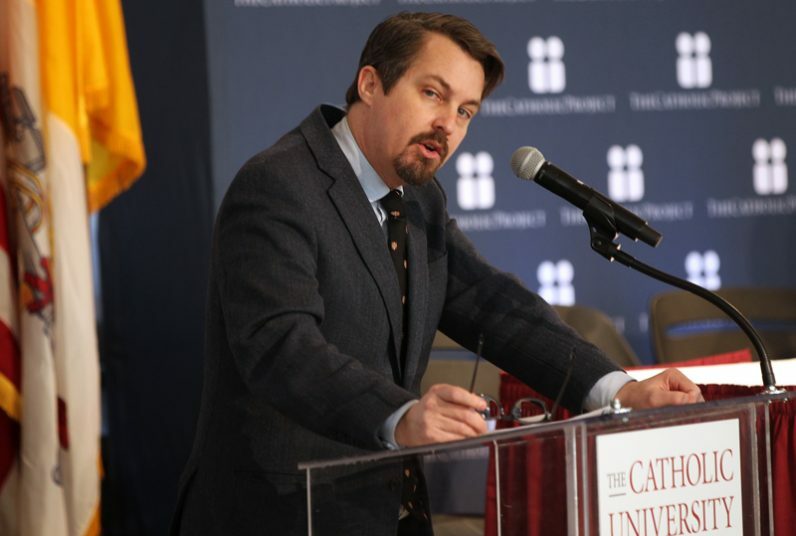 The Root Causes of the Current Crisis,” other conference sessions also explored the role of power and clericalism, sexuality and sexual teaching, and how the media reflects the causes of clericalism. The management experts said they had no specific insights into the causes of the abuse crisis and that to develop such insights large-scale research would be needed. But they said they wanted to share their perspectives on organizational behavior to help the church understand what happened and how to remedy its causes. Weaver said a formal ethics infrastructure can help foster good behavior in organizations and that the rules, policies, programs, monitoring procedures and disciplinary practices that are part of such an infrastructure often are introduced after a scandal. He suggested that formal steps be matched by supportive behavior from leadership and efforts to ensure that concern for proper action become part of an organization’s culture. The presentation also focused on the steps to ensure that all members of an organization are governed by ethics policies, that individuals understand that reporting misconduct is helpful, that discipline for violating policies is of “appropriate quality, quantity and consistency,” and that violators of policies are not promoted. Likewise, the experts said, actions by an organization’s leaders are a key influence on organization’s culture. They warned that rationalizing bad behavior, keeping quiet about problems, not holding people responsible for their actions and treating formal policies “as meaningless window dressing,” can have negative effects. Brown explained that the abuse crisis was handled in different ways from diocese to diocese — with some bishops responding appropriately and some mishandling reports of clergy abuse. “As a moral manager, an ethical leader is someone who is recognized for having strong character and integrity. As a moral manager, an ethical leader uses the tools of leadership to promote good conduct among others,” Brown said. Within the Catholic Church, he continued, “an ethical leader, specifically a bishop is a moral person when he is a spiritual father who is strong in his faith and supportive of and compassionate to others. As a moral manager, a bishop must encourage virtuous behavior in others” and provide clear teaching, set and communicate personal conduct standards, monitor violations and discipline people who violate the standard. “A bishop who is a strong ethical leader provides a personal witness and clear ethical guidance conveyed with the goodness of a father that inspires others to follow not out of obligation, but of love,” Brown said. Conflict between a bishop’s role as CEO and spiritual leader may have contributed to the crisis as well, Brown said. He suggested that bishop’s administrative role may consume so much time and be so overwhelming that there is little time left to attend to his own mental, physical and spiritual health and well-being. “I don’t know of too many CEOs of business organizations who could succeed if they were given dual roles for administering the business and simultaneously attending to the spiritual needs of their employees,” Brown said. He suggested turning to canon law to identify the traits and qualities needed in a bishop: outstanding in solid faith, good morals, piety, zeal for souls, wisdom, prudence and human virtues.